People all over America eat honey everyday, but did you know where it comes from? 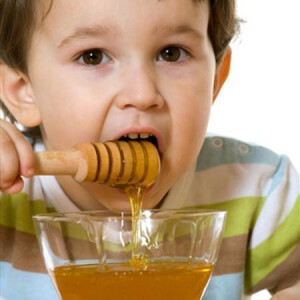 If you thought that honey comes from bees, you’re almost correct! In fact, bees make honey, but they get their supplies from flowers, in the form of nectar. Nectar is like a sweet juice contained inside the flower, and it is made up of water and sugars. That must be a tasty drink for the bees! When a bee finds nectar, it does a special dance to tell the other bees where the nectar is. Once the bees digest the nectar, they convert it into honey, and then store it in the honeycombs of the hive. The bees move their wings very fast and the draft helps the honey to become thicker. Finally, the honeycombs are sealed with wax. When many bees do this, they can produce a lot of honey together. At this point, the beekeeper can come along to collect the extra honey and process it to use or sell. They can also remove the beeswax, because it is very useful for humans. Did you know that in old times, people used to make candles and seals with beeswax? Bees can be divided into three categories: workers, drones and one queen. Each type of bee has a different job to help their community survive and create new baby bees. We use honey in many different ways today. We might spread it on bread, mix it in cake batter, drizzle it on pancakes, or even coat barbecue meat in it! Honey comes in many different forms. At the store, you can buy liquid honey, creamed honey, and honey with a piece of honeycomb in the jar. Honey contains a lot of good things in it. In fact, it is the only type of natural food source we know that contains everything that a human needs to be nourished. Bees have to work very hard to make honey. To make just one pound of honey, they need to collect nectar from around two million flowers and fly more than 55,000 miles! During a bee’s entire life, it usually only makes about one and a half teaspoons of honey. Sometimes beekeepers feed extra sugar to their bees to help them out, and they also plant plenty of flowers nearby. In the United States, each person usually eats almost 1.3 pounds every year! Since honey is so popular here, beekeepers need to have a lot of bees to create enough honey for all of us. While some people keep bees for their work, other people simply do it as a hobby because they love bees. Let’s have a look at some fun and interesting resources to learn more about these amazing insects and honey. Do You Know How to Spot a Honey Bee? What Exactly Do Bees Do? Why Are Honeybees So Special? Make Your Own Bee and Email It!